to assist developing countries in achieving sustainable development. CDM projects earn tradable, saleable certified emission reduction (CER) credits that can be used by industrialised countries to meet a part of their emission reduction targets under the Kyoto Protocol. Benefits of CDM projects include investment in climate change mitigation projects in developing countries, transfer or diffusion of technology in the host countries, as well as improvement in the livelihood of communities through the creation of employment or increased economic activity. This page serves to highlight where, how and what has been the impact of the CDM across the globe. The second benefits report updates the previous report (2011) adding several new elements on the overall impact of the CDM. 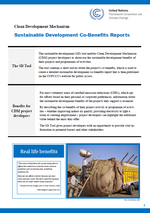 In addition to updates on the claimed contribution of CDM project activities to sustainable development, transfer of technology it includes revised estimates of finance and costs for various types of projects, new estimates of savings and revenue due to the use of CERs, examines differences between CDM and non-CDM projects and provides opportunities for improvement in the regional distribution of the CDM. A first in a series of assessment reports on the overall contribution of the CDM to society. 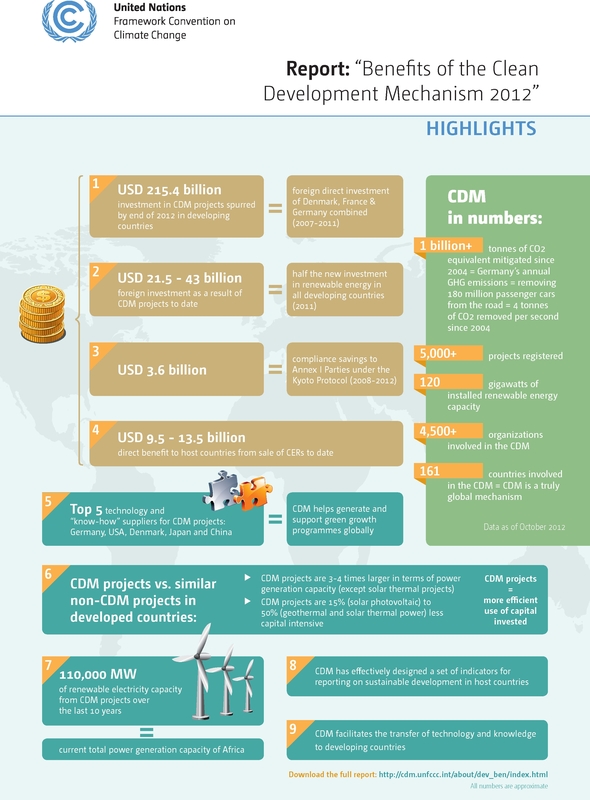 The report highlights the contributions of registered CDM project activities to sustainable development and technology transfer, and also provides a first estimate of overall capital investment and abatement costs of various types of CDM projects. The CDM offers opportunities for sustainable development but also brings important co-benefits, such as poverty reduction, access to energy efficient lighting and cooking, improvement of air quality and living conditions, reduction of costs and generation of jobs and skills. The UNFCCC secretariat is gathering information on CDM projects to highlight their contribution to improving people's lives. Some projects have been identified as making a unique contribution in this regard. Since 2007, the UNFCCC secretariat has been assessing one of the more measurable co-benefits of the CDM – its contribution to the transfer of technology and knowledge between countries. In doing so it focuses on projects in all host countries and at all stages of development and implementation. The full studies are available for download.